Stromboli and I have yet to make peace with one another. This is my second attempt. I would call it a success over the first, but still not a sweeping victory. If you don’t care to hear about the lessons I learned, then feel free to hop right on over to Lauren’s Latest to read about her (lovely) stromboli, and how you, too, can make one for yourself. That said, mine still tasted just fine. Just fine, I tell you! I made the dough. Rolled the dough. Sauced it. And topped it. And rolled it up! Good to go, right? Wrong. Here’s where things got a bit complicated. Do not, under any circumstances, think you can transfer your stromboli onto another cooking surface. You can’t. I don’t care how great you think your pizza stone is. Your stromboli will not move from the surface on which you created him. He won’t. He’s stuck. And so, you bake him where you make him. Done. 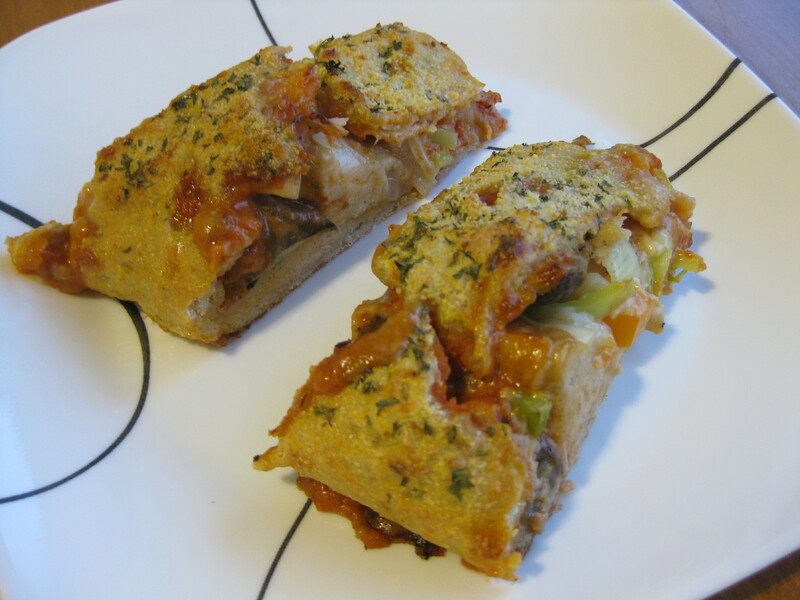 All that said, the stromboli (potential) disaster, turned out pretty tasty! Definitely something to make again! I will succeed! Go see Lauren for the recipe. You won’t be sorry! I recommend following her directions down to the letter. Do as I say. Not as I do. have you tried using corn meal? I’ve made a lot of pizza, and if you don’t put a generous helping of corn meal down onto the cookie sheet or whatever you make it on, it will stick, badly, as you have described. I recommend actually using one of those pizza oven peels, the wood ones work best, cookie sheets are a good last resort but make sure there’s no lip. Make sure when you put the corn meal down, that you actually shake the pan or peel to make sure the dough moves WELL before you put toppings on it. I haven’t tried this with strombolli, but I am pretty sure if you make sure your dough isn’t too sticky to begin with, and then add cornmeal, you should have success. Daniel. That makes me feel so much better! I think that was my problem. I kneaded it, but then didn’t add the flour right away, it was maybe a couple of minutes later. Thanks for all the advice, friends! You make me laugh, friend. I love this! General dough trick (although I don’t know if this works with stromboli? 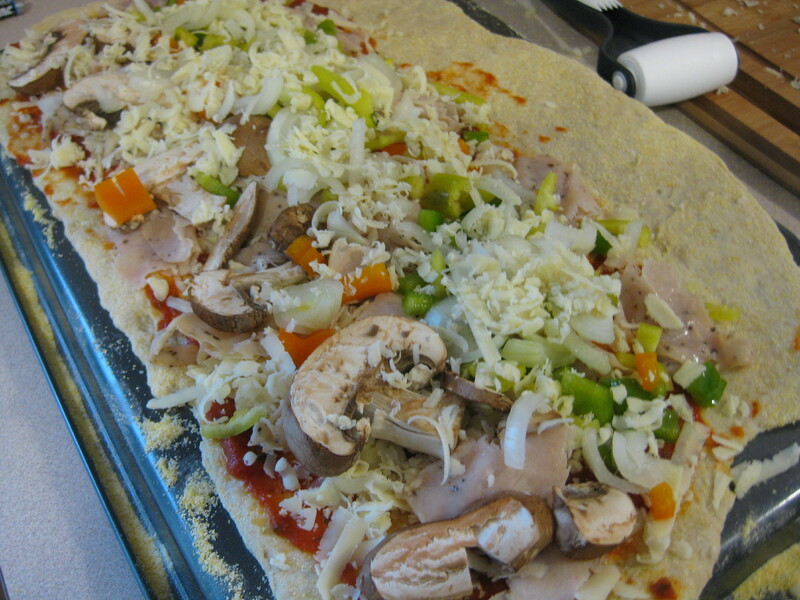 )….if the dough is sticky, just add a bit of flour until it is more malleable. I did that, too! That night was apparently not my night for working with dough 🙂 It was sticky, but the flour would get stuck on the outside of the dough, and wouldn’t work into it. I have no idea what was going on. Sigh. Well, these still look scrumptious. I’m totally inspired to try this. Random blog stalker, here — I hate messing with pizza stones and dirty pizza stones, so I leave mine in the oven at all times. Then I just put my pan on top of it. However, if you’re a stickler for just the stone, try rolling your dough out on parchment paper (not wax paper), and then sliding the parchment paper from your pan (flat or the back of a pan is best) onto your pizza stone. I love parchment paper. I usually put olive oil on mine and then cornmeal, for for the taste and texture than the non-stickiness. That said, I must admit I’ve never made stromboli. If I made stromboli, I wouldn’t like it without something hot to balance the sweet. Like pepperoncini, perhaps. But of course, that’s just me. Well hey, random blog stalker! Long time, no hear from. Thanks for the advice. I always forget parchment paper is such a great tool. I should put it somewhere more prominent in my drawer. Maybe that would help. Thanks for the suggestions! Andrew and I love stromboli! The recipe we have is different in a couple ways. I don’t make bread dough often because it’s pretty hit or miss for me. We buy a bad of 3 (1 pound) frozen loaves and when they are thawed they roll out pretty well with some flour. They do turn out a little fluffy and we fight over the end pieces. Love this post! How full do you stuff your stromboli? Is there such a thing as too full? Or no?